The 252 Vaishnava disciples are all parts of Shri Gusainji's divine form. They are of three types; 84 are predominantly tamasi, a virtue that can roughly be translated as obstinate. The other two groups of 84 are chiefly rajasi and satviki, passionate and pure. These are the groups within the 252 Vaishnava disciples of the bhaktimaster, Shri Gusainji, whose form holds all spiritual powers. One day when Shri gusainji was in a joyous mood, he mentioned to his wife, Shri Rukminiji, that his bhaktas represented all the various parts of his body. His wife questioned,"What part of your body is your desciple Chachaji?" 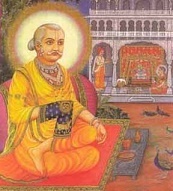 Shri Gusainji responded, "Chachaji is the pupil of my eye." Later, when Chachaji stubbed his toe Shri Gusainji's eyes hurt. When Rukminiji asked him why his eyes hurt, he replied, "My eyes ache because Chachaji is in pain." Shri Gusainji's eyes recovered when Chachaji to was better. In this way, Shri Gusainji showed his wife the form of the accomplished bhakta. One should never offend a bhakta for there is little difference between Krishna and His bhaktas. In Shri Mahaprabhuji's Pusti Pravaha Maryada" he explains, "A soul that is Pusti is different. There is no doubt about this. Grace-filled souls appear for God's pleasure. Their forms, incarnations, virtues and actions are all similar to Hari's. There is no adequate comparison for either God or His bhaktas." This is the authentic nature of the bhakta. Now you can be one of the Gokuldham 252 Vaishnavas. Nyaochhaver is only $3600. You can pay All at one time, or Monthly, quarterly, twice a year or once a year for 3 years.